FEI led a team with BOP Consulting on a year-long research project devising a strategy for the Festivals Forum and Festivals Edinburgh to support the twelve major festivals including Edinburgh International Festival, Edinburgh Festival Fringe, Royal Edinburgh Military Tattoo and Edinburgh’s Hogmanay. The team researched four major international competitor festival city destinations and undertook an extensive situational analysis making thirty six recommendations for action. 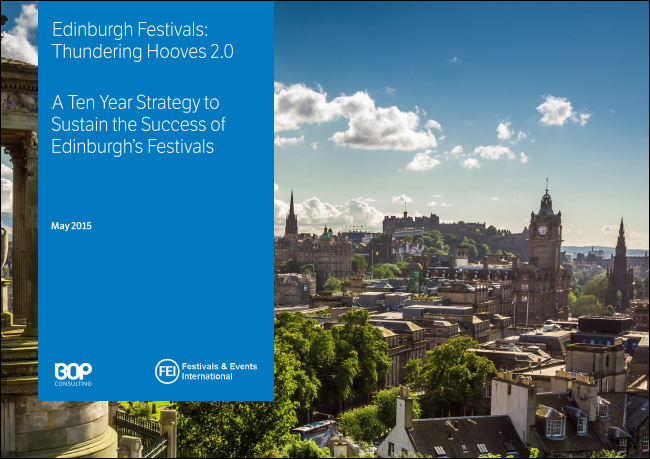 FEI is delighted to announce the publication of the new ten year strategy ‘Thundering Hoovers 2.0’ devised by us, with our colleagues at BOP, to ensure the success of the Edinburgh Festivals in the decade ahead.